The global fat replacer market is estimated to register a CAGR of about 6.5% during 2018-2023 (the forecast period). Chemically, fat replacers resemble fats, proteins, or carbohydrates. The rising awareness regarding health issues among consumers is making them change their dietary habits and eat less amount of fat. Therefore, owing to these reasons, fat replacers have a huge market opportunity. At present, fat replacer is a boon for the society, as the high fat intake can lead to obesity and cause cancer, high-blood cholesterol, or coronary heart disease. The rising demand for low-calorie and low-fat diet is identified as one of the primary growth factors for the fat replacer market. By choosing these alternative food options, health-conscious consumers can maintain their basic food selection pattern and easily adhere to a low-fat diet. The World Health Organization recommends that the total fat intake should be less than 30% of the total calories and the saturated fat should not exceed 10% of the total calories. Each gram of fat contains nearly 9 calories, when compared to protein or carbohydrates that contain 4 calories per gram. Consumers are, thus, moving toward fat replacer as a popular approach to low-calorie diet. Fat replacers do not compare well with the flavor of their full-fat counterparts, which can be a major restraint to the market. A majority of fat replacers is ‘Generally Recognized Safe’ (GRAS). Health-conscious consumers are seeking the long-term impact of consuming fat-replacers; however, the possible toxicological traits associated with its excessive consumption, like Ketogenesis, which is a hurdle in the growth of fat replacer market. 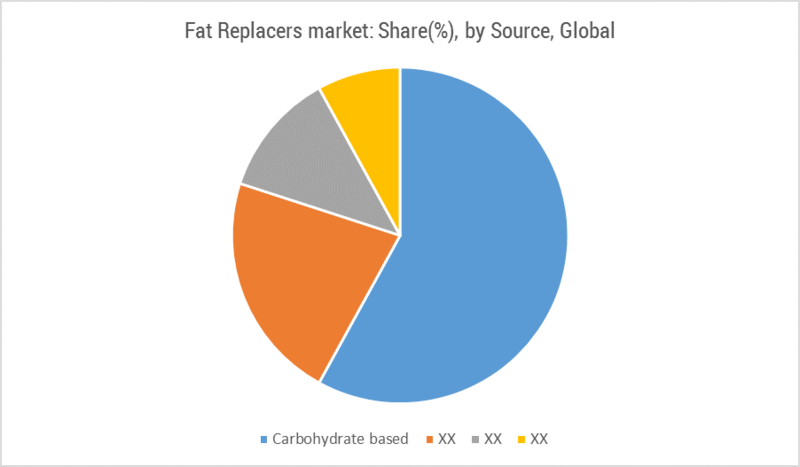 The global fat replacers market is segmented by type, application, and geography. By type, this market is further segmented into carbohydrate, protein, and lipid-based fat replacer. Among these, carbohydrate-based fat replacers segment retains its position at the top of the market and accounted for a market share of about 58% in 2016. By application, the market can be categorized into processed meat, bakery & confectionery, beverages, and convenience food, among others. Among these, the bakery & confectionery segment accounted for the maximum share, followed by beverages with 24%, and others. The demand for fat replacer is growing in fermented dairy products, due to the rising yogurt market and fermented dairy products market. As of 2016, North America held the largest market share in the global fat replacers market. Recently, the demand for low-calorie food and beverages has grown in the region. Within Europe, the fat replacer market is dominated by the United Kingdom, followed by Germany, Russia, and others. Among other regions, Asia-Pacific is estimated to register a CAGR of 7.20% by 2023, owing to the growing population, and rising nutrition requirement per person, especially in the dairy industry, coupled with healthy dietary habits. The companies, such as Sensus, are working on the concept of fat and sugar reduction as a combination, for example, the use of inulin in some cereal and dry bakery products. Another example is Ulrick & Short, a British clean-label ingredient company, who added a new variety for fat replacer, Delyte 9, to its product portfolio. This new ingredient Delyte 9 is effective for dairy-based confectionery products, such as, custards, and creams. This ingredient is expected to not only decrease the fat content but also increase indulgence. Major Players: Cargill.Inc, FMC Corporation, ADM, Pfizer Inc., Tate & Lyle, IOC Group, Unilever Inc., DSM Food Specialties, Mitsubishi Kaizen Food Corp., and Andeavor, among others. In 2015, Cargill launched a unique starch enabling a minimum of 50% fat reduction in yoghurt.